I've completed my project with Martin Kohala who is a heavy weight boxer. He fights for UBL Boxing Club and entered a title fight in Dudley on the 3rd of May 2014. 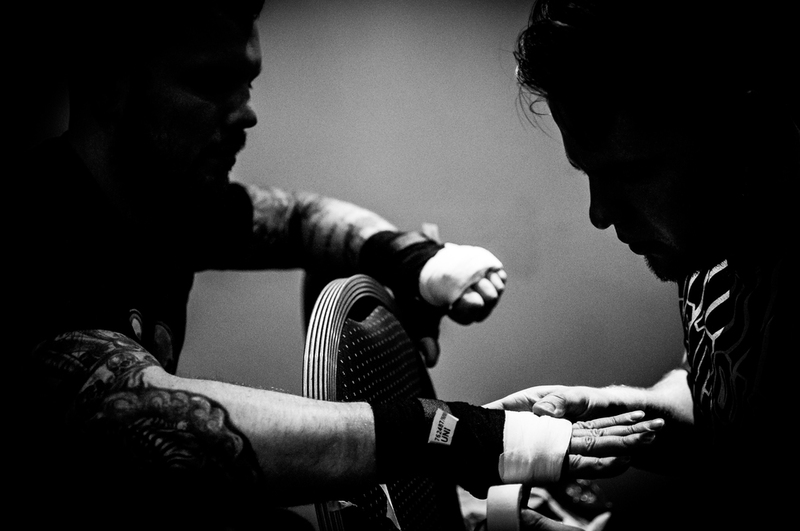 I spent a month following him around at the gym and at home in the build up to his fight. My aim was to document the life of an unlicensed boxer. The result became something much more profound. This project developed as I understood what I was doing and learned more about Martin. At first Martin hid is true identity from the camera. He was open with me but when the camera was pointing at him, he almost put on an act. I felt I didn't really get to see his true self through the lens, so I've created this body of work where you won't see Martin in the images. He will make no eye contact and most of the images obscure his face. As the relationship with Martin and the lens develops, so does the images. More of him becomes visible to the lens. I'm no poet and not a poetry fan but I loved this line and felt that it works really well with this body of work and the contextual depths.